To bridge the holiday season, I’ve embarked on a post series titled “Something Old, Something New, Something Borrowed, and Something Blue.” (Original titles? Yeah, nah… 😉 ) So far I’ve traversed Something Old, with Elizabeth Jane Howard’s Sea Change, and Something New, focusing on Bahiyyih Nakhjavani’s Us & Them. Today it’s the turn of Something Borrowed and the book is Megan Whalen Turner’s Thick As Thieves, the fifth novel in her A Queen’s Thief (or as I think of it, “Attolia”) series. I believe the books may be regarded as standalones by some, but with a continuing and developing storyline, as well as recurring characters within each book, I’m inclined to regard it as a series. I also think you’ll have a much better appreciation of each book if you start at the beginning with The Queen’s Thief. I, however, have already read the first four books and so borrowed Thick As Thieves from my friend and fellow SpecFicNZ-er, Liz Gatens, who is a great fan of the series. Nor is she alone in this. The Queen’s Thief series has a dedicated following that has elevated preceding books to New York Times bestselling status and whose members are prepared to wait out the relatively long gaps between the novels. This, they will tell you, is because of the depth of the storytelling and the fascination of the continuing characters, particularly Eugenides, the thief for whom the series is named. The overarching story concerns a group of small kingdoms that resemble the Fifth-Century-BC Greek states, including in their basic social, political, and cultural arrangements, confronting a large and expansionist Empire that again resembles the Persia of the Fifth-Century BC era. The empire is even called Mede so the analogy to the kingdom of the Medes and the Persians seems fairly clear. Having said that, the military technology and the presence of a counterbalancing alignment of great powers to the north (think Spain, France, and the Holy Roman Empire) resembles that of the Renaissance Mediterranean, with the Ottoman Empire occupying the same or similar territory in Asia Minor and North Africa that the Persians did one thousand years earlier. The smaller nations confronting both empires, though, found themselves in a very similar situation to the Attolia, Eddis, and Sounis of Megan Whalen Turner’s series. To return to the overarching story (having canvassed the historically informed backdrop 😉 ), it basically revolves around the endeavors of Eugenides, and the Queens of Attolia and Eddis in particular, to maintain the independence of the three kingdoms and stave off a Mede invasion. In the first three books, Eugenides was the central focus. The latter two have followed new characters whose circumstances are nonetheless interwtined with those of Eugenides and the three kingdoms. 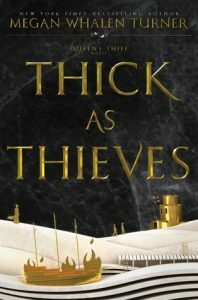 In Thick As Thieves, the main character is Kamet, a Mede slave with ambitions to advance in the bureaucracy of the Empire (a bureaucracy which, like that of the Byzantine Empire, is largely made up of slaves) who is forced to flee for his life from the Mede capital. 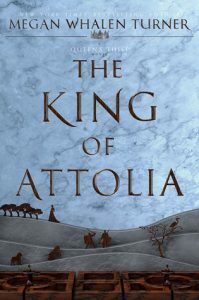 He is assisted by an Attolian soldier, Costis (who was the main character in the third novel, The King of Attolia) and the story comprises their long flight, traversing the Mede empire, to the promise of safe haven in Attolia. Of course, promises in such cases should not always be taken at face value – but to find out why I would make so cryptic a remark, dear readers, you will have to read the story for yourself. AKA, no spoilers here! As you have probably gathered, Thick As Thieves is a classic quest journey. It’s also very much about the friendship between Kamet and Costis, so in that sense it’s a bromance. And it’s a coming-of-age story as Kamet gets to know considerably more about himself and the world, as well as the machinations and motivations of the arch Thief, Eugenides. By way of observation, which you may or may not consider relevant, I note that all the major players in this story are men – all the women are walk-on parts at best. Overall, I enjoyed the characters, the journey, and the read: the story is well written and well told but—perhaps because of the change in setting and character focus—did not spin my wheels quite as much as some of the earlier books in the series. I still found it a very engaging read, though, and followers of the series should also enjoy it. 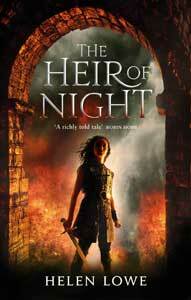 I believe it will also appeal to those who enjoy historical fiction set in the Classical history era (such as novels by Mary Renault, Gillian Bradshaw, and Robert Harris’s Imperium and Pompeii) and historically informed Fantasy such as Guy Gavriel Kay’s Children of Earth and Sky, and Neal Stephenson’s Quicksilver. Those who enjoy Fantasy and historical fiction with a coming-of-age focus, such as Philip Pullman’s The Golden Compass, Kristin Cashore’s Graceling, or Cynthia Voight’s Jackaroo, may also enjoy Thick As Thieves.